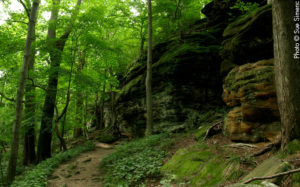 There’s no question that Cuyahoga Valley National Park holds a special place for many people. 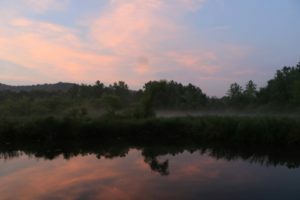 For donor and Conservancy board member Liz Piatt, that special connection goes back to her childhood when her parents would take her to the park for adventures at the Ledges and Kendall Lake. As an adult, Liz carried on this tradition, sharing the park with not only her spouse and children, but also her friends, students and coworkers. When there’s a college class to be taught, party to be hosted, or seminar to give, Liz always recommends the park. As a board member, Liz gives countless hours of her time and energy. But she also gives knowledge and insight into the park that goes back generations – and prepares the park for the future. Why is the park special to you? I will always associate the park with spending meaningful time with my family. When I was young, it was a place where I could just hang out with my parents. I felt like my parents really connected with me when we were in the park. They both worked and led busy lives; but, at the park, we could relax and have fun. I learned recently that my step father was a volunteer ranger at the park before it became part of the National Park system. Before I was born, he volunteered and would be in the park regularly. This appreciation has carried over into my own family. Since my kids were little we’ve gone to the park. Even though they are grown, the park is still a big part of my children’s lives. My daughter likes to use it for hiking to relieve stress. My son and I still do the Fall Hiking Spree every year [through Summit Country Metro Parks]. It’s just a magical place for kids of all ages. I chose to serve on the Conservancy’s Education Committee for this reason. If you introduce children to Cuyahoga Valley early they’ll become lifelong users of the park. With the Education Committee, we get to help the Environmental Education Center connect the park to kids in the community. I like running in the park, and I use my running to really meditate and pray. The park is really just a good environment for that: the quietness of it. Connecting with Creation. It removes you from the noise of the city. Just thinking about going for a run calms me down! When I’m training for a half marathon, I like to be on the Towpath because it mimics a road surface. Organized runs are also a good resource here. I’m a member of Black Girls Run – a running club for African American women 18 and older – and I’ve hosted runs in or near the park. It’s helped introduce the park to runners who have never used it before. It’s opened up their eyes to the great trails. Why is it important for you to share the park with others? I always try to get people the park, whether it’s my running club, students, coworkers or friends. I had a friend who turned 40 in March, and I asked her if I could organize a birthday party for her. She loves to be outside, but she had never really used CVNP. We rented the Stone Cottage and had about 20 people join us. Out of those 20, only two had used the park before. They were amazed. They kept asking me: “how in the world did you find out about this building?” We got to take a hike down to Stanford House and back. I’ve hosted a women’s retreat with my Church at the park. In June, I brought students from Kent State’s McNair Scholars Program to the CVEEC for a leadership retreat. How have you used the park as a professor? Even though I love CVNP and use it regularly, as a person of color it is obvious to me that when I come into the park, people aren’t used to seeing someone like me. I taught a course in the park last year called, “Stuff White People Do.” It was a three-week class where we were at the park every day doing research into visitor perceptions. Visitor data indicates that national parks are predominantly “white spaces,” and we wanted to understand how that impedes visitorship among people of color. As sociologists, we wanted to more clearly define: what are the barriers to visiting for communities that are underserved? We conducted interviews with staff and focus groups with members of the African American community. It was eye opening for everyone. Many people don’t realize that visitorship by underrepresented populations is a “thing.” CVNP is often referred to as an urban park, but for people who live in urban communities, they see it as a place surrounded by suburban neighborhoods. These are the communities you have to drive through to access the park, and people of color oftentimes have negative experiences. There was one man in our focus group who shared a story that got a lot of heads nodding. When he was in high school, his football team had a picnic in CVNP. He was walking around with a few friends, and a car drove by. The driver said something to the effect of, “you guys shouldn’t be here.” These experiences and perceptions get in the way of everyone enjoying the park. Our research lays the foundation for the Park Service and Conservancy to overcome these challenges. The National Parks are for the people. For all of us. 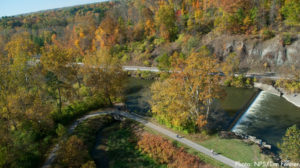 I want to make sure that our park – Cuyahoga Valley – is a place where people from my community can come and enjoy all of the things that it has to offer and feel comfortable. I want them to receive all of the benefits that I do: peace, quietness, connecting with family. Sharing the park with others helps assure that it’s here for future generations. In the summer of 2016, tied to goals of the NPS Centennial around relevancy, the Conservancy established a board committee on Diversity, Equity and Inclusion. Based on their work and research done by Liz and by Jennie Vasarhelyi, Chief of Interpretation, Education and Visitor Services for CVNP, we developed an action plan for making our programs and the park more inclusive and welcoming to all. Thanks to support from the George Gund Foundation and the Cleveland Foundation, we will be developing new programs and partnerships and providing staff and board leadership to this effort. Some of the key outcomes we are working on include diversification of our staff and volunteers, development of programs with neighborhood organizations, translation of resources to various languages and celebration of diverse cultures in our program.